Acting on behalf of a consortium of three owners in Sheffield, CBRE’s Northern Land and Development team and Sheffield agents Fowler Sandford brings to market Attercliffe Waterside. The 22 acre urban regeneration site, adjacent to the Sheffield and Tinsley Canal, is one of the most exciting development opportunities in the North of England. The property is located in the Lower Don Valley, midway between Sheffield City Centre and the M1 motorway. The Lower Don Valley is now an engine of growth and an industrial powerhouse of national significance. It contains world class advanced manufacturing research and production facilities and a retail, sports and leisure cluster that serves the whole Sheffield City Region, including Meadowhall, Ikea, Sheffield/Arena, English Institute of Sport and Ice Sheffield. The site is located close to the Sheffield Olympic Legacy Park (SOLP) and is ideally positioned to benefit from this huge investment into Sheffield’s regeneration. The SOLP will create a unique research and innovation environment for the production of new products, processes and services in healthcare technologies, sports and exercise medicine. The £14m Advanced Wellbeing Research Centre will become the most advanced research and development centre for physical activity in the world. It sits alongside a University Technical College (UTC) for 600 students and Academy for 1,200 pupils and further phases of private commercial development are currently being planned. The site is currently owned by Sheffield City Council, Canal & River Trust and Norfolk Estates, who have agreed to consolidate their ownerships into one marketable area under a Development Agreement. Attercliffe Waterside presents an unusual opportunity to regenerate a large urban area with canal frontage into a mixed use, residential led development and benefits from an Informal Planning Advice Note (IPAN) agreed by Sheffield City Council to allow phased or “one off” offers from interested parties. 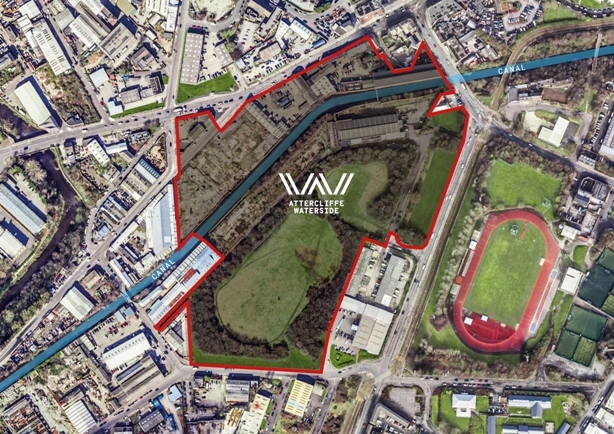 Coun Mazher Iqbal, cabinet member for Business and Investment,said: “This is a really important site for the regeneration of Attercliffe and the Lower Don Valley. It is an exciting opportunity for an imaginative team of developers to help us to make the East End of Sheffield a fantastic place to live as well as to build on the existing network of great places to work and play.